Set up automatic reminders so that you and your team don't need to waste time chasing clients. 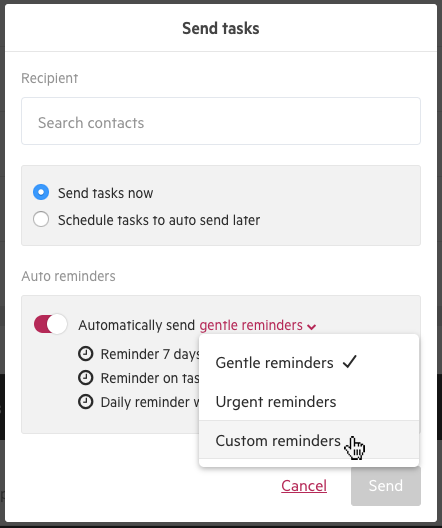 There is an option to schedule automatic reminders to send to your clients, reminding them to complete any outstanding client tasks. You can choose to have your clients reminded gently, urgently or based on your own customizable preference. Gentle reminders: send seven days before the client task due date, on the client task due date, and then every day after a client task is overdue. Urgent reminders: send every day. If you later edit custom reminders to select a different frequency, the next reminder will be sent the number of days you chose from the date it was changed. Example: If the custom reminders were originally set to sent every 3 days, and then today you change the reminders to send 7 days, the next reminder will be sent 7 days from today.